Congratulations, you’ve graduated from high school and moved out of your parents house. You’re in college, which means you’re an adult now, right? Well, yes and no. You’re living on your own, managing your own time, and doing your own laundry. However, unlike a “real” adult, your full-time job is being a student. This can make keeping your bank account above zero a real challenge. Don’t despair. 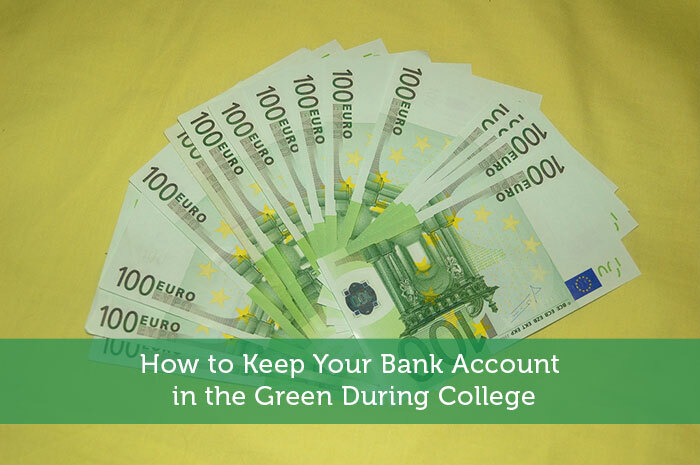 With these six tips, you’ll be able to keep your bank account in the green. If it’s possible with your schedule, getting a part-time job is the single best thing you can do to make sure you never run out of pocket money. Yes, you will, but you can probably get them from your school’s library for free. If your library doesn’t have them (or doesn’t have the correct edition), buying a used copy from Amazon is almost always cheaper than a used copy in your local book store. If Amazon is still too expensive, check out Chegg, eCampus, or CollegeBook Renter. These sites allow you to rent a textbook for a semester, or a year, for far less than it would cost to buy the book. Apart from tuition, room and board will likely be your biggest college cost. According to The College Board, room and board for the average full-time student going to a public school, in-state, is $8,535 per year. For students going to private schools, or out-of-state schools, it is much higher. However, students who work as Resident Advisors (RAs) usually get either free room and board, or at least have it significantly reduced. In fact, many even receive a stipend. Did you know that your tuition pays for more than just your classes? Well, it does. Most campuses are bursting at the seams with on-campus entertainment, including: movie rentals from the library, intramural sports, gym membership, guest lecturers, student clubs, and more. Again, according to The College Board, the average student living on campus spends $1,989 per year on “personal expenses,” much of which they could get from their school. Here’s a big and scary thought for you: life isn’t always controllable. Sometimes parents get divorced, or lose their jobs. Sometimes there’s a death in the family, or unforseen medical expenses. If your financial circumstances change, or if you’re doing your best but still struggling to make ends meet, talk to your financial aid office. They might be able to increase your scholarships, grants, or, yes, your loans. Although it’s a good idea to borrow as little money as possible for college, life isn’t controllable – forget the “always.” Don’t be afraid to ask for what you need. One last note: although it may seem like some of these tips aren’t applicable if you’re getting an online nursing degree, or other online degree, the ones that are applicable are even more important. For example, saving receipts, getting a part-time, and asking for what you need. Also, renting textbooks can still save you a lot of money, so check it out! Zachary Katz-Stein graduated from Kenyon College in December 2012. He now works as a free-lance writer when he’s not teaching yoga classes. I worked as a service crew in one of the fast foods before when I was in my first year of my college life. From my part-time income, I can buy what I want because I have an extra income. I also save my allowance coming from my parents in my bank accounts. Working part time is more practical and productive experience rather than spending time with your room mates. This suggestion is going to sound ridiculous, especially considering you make a point about becoming an RA for discounted room and board, but consider living off campus. At the college I went to, room and board was $850 a month. However, I rented a 3-bedroom house with 2 other girls and we split the $650 rent ($216 each). Factor in groceries of $150/month for 3 people split evenly as well and renters insurance, it was waaay cheaper than living on campus. Over the course of 4 years (living there year round), I saved more than $22,000! I worked at a school library when I was in college. It was literally “work-study” since I could study for my exams when the library wasn’t busy and get paid doing it! I never went to college but if I did I would definitely look into co-oping or doing some sort of apprenticeship at a company in the field I going into. This way I would be able to earn extra money to get through college plus give me the expreince most employers look for. My brother did this and because he has the experience the company even covered a portion of his tuition. These are some awesome tips that I wish I had when I was a grasshopper in college. Trust me I will make sure my daughter does not make the same mistakes. I think having a part time job while in college is not only good to make extra cash, but can also help students build good work ethics before going out into the real world. I started out with a work-study job. It was OK, but annoying that I was limited to 10 hours a week. When I went to college, that meant a cool $50 every other week roughly. By the end of college, I ditched that and got a real part time job where I could make more. The only regret I have is not putting some money into a 401k at the time. Becoming an RA is a great opportunity. I was an RA for two years at my university and I saved so much money. For being an RA in an apartment setting at my university, the university paid for my tuition and housing and gave me a food stipend. Not only did I save a lot of money, I received great experience and have stories that I still tell today. I worked at the college library part time the four years I was at college. It was a great way to make just enough money to pay the bills I was incurring during college. Tons of great advice tips mentioned within here! Living expenses tend to get expensive, which is why it may be best to look into any and all options. From living on or off campus to having a roommate, there are ways to save within this area of college life! Thanks for sharing!